Glomus tumors are also known as temporal bone paragangliomas. They are vascular tumors of chemoreceptor organs derived from the neural crest. They were first described by Rosenwasser in 1945. Glomus tumors may cause hearing loss or pulsating tinnitus. Glomus tumors characteristically affect hearing because they often are located within or adjacent to the temporal bone. Involvement of the ossicles may cause a conductive hearing loss. 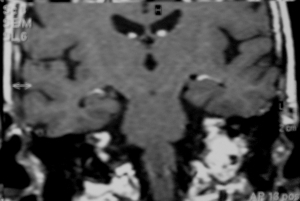 With extension into the mastoid antrum the facial nerve may become involved. Growth through the tympanic membrane may cause bloody otorhhea. Glomus tumors may also affect other nerves in the face (cranial nerves) producing paralysis of the face, pharynx, vocal cords and tongue. They can develop in the middle ear (called glomus tympanicum), the jugular foramen (glomus jugulare) or in the skull base (glomus vagale). The graphic below illustrates the glomus tympanicum location. Glomus tumors are diagnosed by a combination of their location and their highly vascular nature. Physical examination usually reveals a red mass behind an intact ear drum. Blanching of the mass on pneumatic otoscopy is referred to as Brown's sign. Tumors may be treated with radiation or surgery. Surgical treatment often requires obliteration of the middle ear producing a conductive hearing loss. In the past, surgical treatment has been somewhat risky with reports of mortality between 22% and 17%. Recent advances in surgical technique have enabled better results. Surgical control can be obtained in 85% of cases with a mortality rate of 2.7% and a recurrence rate of 5.5% (Jackson et al, 2001). Function preserving surgery rather than obliteration of the middle ear has been growing in frequency (Kunzel et al, 2012). Many serious complications are possible related to the vascular nature of the tumor. These include death, CSF leak, infection, carotid artery erosion, stroke and hematoma (Jackson et al, 2001). These include cranial nerves IX, X, XI, and XII which control swallowing, taste, shoulder movement, and tongue movement. In some cases, resection of the carotid artery is necessary. Radiation treatment offers another method of treatment. Radiation can be combined with surgery, or offered by itself. When stereotaxic radiotherapy is used, high levels of radiation are common (e.g. 50 Gy, Kunzel et al, 2012). A major benefit is lower mortality than the earlier reports. Radiation does not kill the tumor but causes perivascular fibrosis. Radiation also often damages the cochlea, causing a radiation induced hearing loss. There are also other risks to radiation treatment including the risk of a radiation-induced malignancy. Glomus tumors can recur. The majority of reoccurances are within the first 10 post-operative years. The median time to recurrence in Jackson's series was 5.87 years. 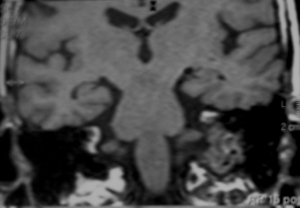 A patient presented with a slowly progressive left facial palsy as well as left sided vestibular and hearing loss. Otoscopy showed a red mass behind the ear drum. MRI scan without contrast. The same area doesn't "light up". Künzel J, Iro H, Hornung J, Koch M, Brase C, Klautke G, Zenk J.Function-preserving therapy for jugulotympanic paragangliomas: a retrospective analysis from 2000 to 2010. Laryngoscope. 2012 Jul;122(7):1545-51. doi: 10.1002/lary.23268. Epub 2012 Mar 27. Kutz JW, Slattery WH. Glomus tympanicum. ENT otoscopic clinic. ENT journal Vol 86, #6, p 317. Rosenwasser H. Carotid body-like tumor of the middle ear and mastoid bone. Arch Otolarygol 1945: 41: 64-7.